THE DIRECTOR OF Public Prosecutions (DPP) is concerned that the constitutional process of trial by jury could be interfered with in the upcoming trial of water protesters, a court has heard. Anti-Austerity Alliance TD Paul Murphy (33) , together with Dublin councillor Kieran Mahon (39), Anti Austerity Alliance councillor Michael Murphy (53) and four other men are due to go on trial next month on charges arising out of the alleged false imprisonment of then Tánaiste Joan Burton, three years ago. Burton and her entourage had left a graduation event at An Cosan Education Centre at Jobstown, Tallaght when a demonstration was held which delayed her for about two hours. 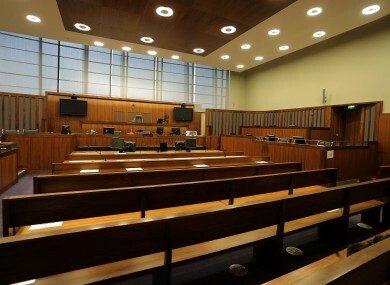 Today Sean Gillane SC, prosecuting, told Judge Melanie Greally at Dublin Circuit Criminal Court that a matter of serious concern had arisen connected with literature made available around the city and a campaign in respect of the trial. He said that an event being billed as a national event was to be held in the capital this weekend and purportedly to be addressed by activists and journalists. He said that under the Constitution a trial is heard by members of the public and there was a concern that this process could be interfered with. He said he believed the court would find that what was happening to be completely unacceptable. Various lawyers for the defendants told the court they had sought clarification from the DPP about the nature of any orders they were seeking from the court so that they could respond. They said the matter would take a number of hours to deal with and Judge Greally listed it for hearing tomorrow afternoon. Murphy of Kingswood Heights, Tallaght, Mahon of Bolbrook Grove, Tallaght, Michael Murphy of Whitechurch Way, Ballyboden, Dublin, Frank Donaghy (71) of Alpine Rise, Tallaght, Ken Purcell (50) of Kiltalown Green, Michael Banks (46) of Brookview Green, Tallaght, and Scott Masterson (34) of Carrigmore Drive, Tallaght each face charges arising out of a water protest in Jobstown on November 15th, 2014. A second trial of six people accused of false imprisonment is due to take place on 2 October 2017 with a pre-trial date hearing for 8 June 2017. Comments on this article are closed due to the ongoing legal process. Email “The DPP is concerned about possible interference in upcoming Jobstown trial”. Feedback on “The DPP is concerned about possible interference in upcoming Jobstown trial”.